Mercedes – still here, and that’s not a bad thing – HubNut – celebrating the average! I’ve been trying to sell the Mercedes 300E for some time now, with For Sale adverts in many different places and a failed attempt to sell via Ebay. The W124 is widely regarded as one of the best saloons ever built by Mercedes-Benz, but that doesn’t seem to stop them being worth pennies. So, I might as well continue to use and improve it. With that in mind, I used it for a trip to The SL Shop in Worcestershire yesterday. Well, it’s always nice to turn up in something fitting isn’t it? After all, my car shares its M103 engine with the R107 300SL. Yes, it’d be a fuel-slurping trip, but it’s nice to treat yourself sometimes – and that’s exactly why I bought this car in the first place. My trip was very well timed as Tony Leach of the Mercedes-Benz Club was present. 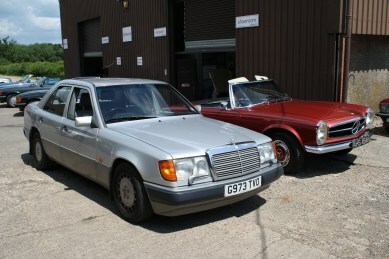 Under the banner of MercDoctors, Tony travels around the UK offering assistance to Mercedes-Benz specialists. His speciality is diagnostics, especially of the 1980s/1990s model range. Perfect! While I did my job, writing about cars for sale and taking photographs, Tony ran diagnostics on the car to check the electrical side of things and then did a smoke test. I admitted to my complete ignorance of fuel injection systems – possibly over-stating my ineptitude, but I’m certainly not over-familiar with how they work. Tony explained that it’s not really that different to a carburettor – it’s just that bits are more spread out. 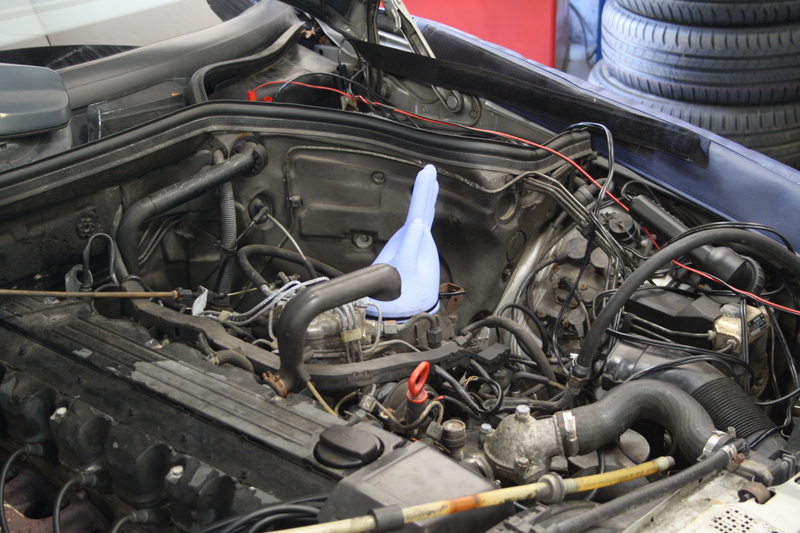 Tony first sealed the induction system, using a latex glove atop the main air input and bungs elsewhere. One pipe was left open and the smoke machine was connected up. The theory is very simple. The smoke machine pushes smoke into the induction system. If you see any smoke escaping, you’ve found a leak. It doesn’t take much of an air leak to cause problems. The fuel injection system carefully and very accurately supplies the correct amount of fuel for any given situation. This relies on a known measurement of air, so if extra air is being sucked in, the mixture ends up being incorrect. Happily, the Mercedes passed with flying colours – no leaks at all. Then Tony adjusted the mixture, with rather more care than I had. I’d simply weakened the mixture enough for it to run properly. It certainly wasn’t running properly when I bought it. Tony was able to hook it up to the necessary equipment to fine-tune the mixture. The result? The car now runs much more sweetly. It no longer hunts when slowing down and it doesn’t stink half as much! Previously, it smelt like the choke was stuck on. Not a nice smell. I should now see an improvement in economy, though it already varies anywhere between 16mpg and 27mpg depending on how I drive it. I covered over 200 miles in the Merc yesterday though, and it reminded me just how pleasant a car it is to drive – though it also reminded me how ill-suited it is to tiny Welsh mountain roads! Too big and far too heavy. Far better to take the better roads, sit back and cruise.